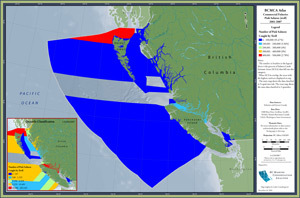 description — The map displays the number of pink salmon commercially caught by troll (2001-2007), displayed by salmon catch estimate areas. The spatial data also includes total number of boat days for years fished, although this is not displayed on the maps. Having read this I thought it was really informative. I appreciate you spending some time and energy to put this short article together. I once again find myself spending way too much time both reading and commenting. But so what, it was still worthwhile!